While settlers have been living in Michigan for many years, starting with the French in the wary 1600’s, it would be many years before Michigan became an state. When Michigan did enter the union as the 26th state, the United States was already over 60 years old. Even with this long settler history, the first records of brewing in the state show that it was the British settlers of the 1800’s, with their introduction of ale. This timeframe coinesides with the completion of the Erie Canal, a newly constructed water route connecting the Great Lakes with the Atlantic Ocean. The introduction of this canal made it easier for immigrants to settle in the western territories like Michigan. Not far behind the British were the German immigrants, and with them came lager beer. As was the case with many other states in the 1840-50s, lager was quickly become the beer of choice. In fact, lager became so dominant in Michigan that in the years between 1862 and 1882 the number of ale brewers in the city of Detroit dropped from 28 to 4. One of the newly dominant lager brewers in Michigan was a guy named Bernhard Stroh. Having learned the art from his father back in Germany, Bernhard setup his own brewery in Detroit in 1850 and quickly started brewing pilsner, a pale lager style. When Bernhard first started his operation, he relied on a door-to-door sales approach, hawking his goods from a wheelbarrow. There were no wheelbarrows involved with my acquisition of beer for this weeks tasting, but that would have been fun. Instead, I relied on some of the dwindling stock from the start of this project that included two different styles from Bell’s Brewery, and some beer from Founders, which has recently started to appear in the state and is now readily available. So, with a nice break in the rain, and a gathering of friends in the backyard, we set about sampling, and then drinking a variety of beer from Michigan. When I setup tastings, I prefer to leave the IPAs until the end. With their hop kick, it usually makes it harder to get anything out of the following samples. However, more often than not lately, we have been encountering situations where it is unclear which beer to start with. With this project, the beer is not grouped by style, or year, like other tastings. 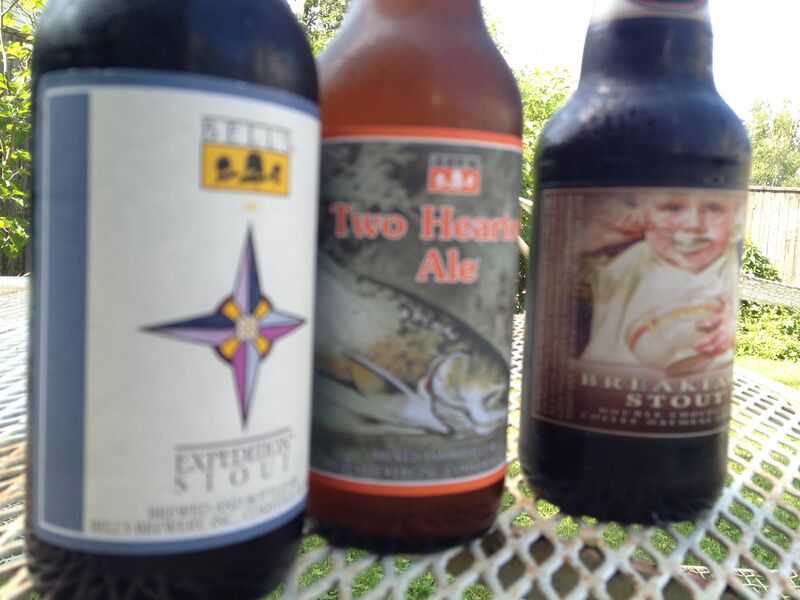 Instead the beer is geographically grouped, and that often results in some strange combinations. And this week is a perfect example. We had two stouts: Expedition Stout and Breakfast Stout, and we had IPAs: Two Hearted Ale, All Day IPA and Centennial IPA. So, sticking with the IPAs last, we kicked off with the stouts. Maybe not the best decision of the night, be we had to start somewhere. The first stout of the night was the Expedition Stout from Bell Brewery. Known as the oldest craft brewer east of Colorado, Bells has been honing their craft for more than 25 years now. Starting with a 15-gallon stock pot operation in 1985, Bells has grown to a 200-barrel brewhouse today. 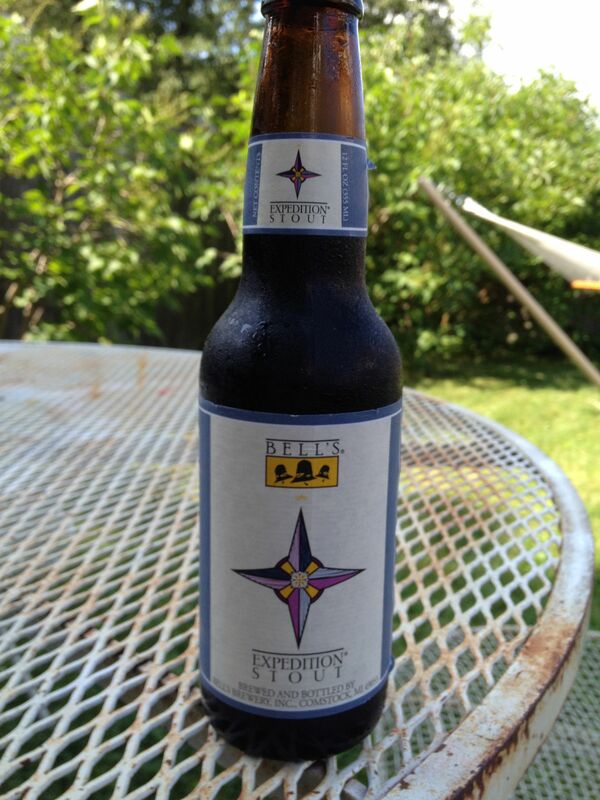 One of the beers that comes from that brewhouse is a Russian Imperial Stout called Expedition Stout. In the glass, this beer was dark. It looked like 40 weight motor oil, and it had a really nice, sweet aroma. The mouthfeel was all malt, and it was enjoyable, placing this beer in the upper echelon for the year. After all the others were sampled, this was the first beer everyone went back for seconds. Following the Expedition Stout, we moved to a Breakfast Stout from Founder’s Brewery. While as dark and malty as the Expedition, this beer was not as thick, and felt lacking in character. I think if I had this beer stand-alone, it would have been just fine, and even well liked. But when compared with the Expedition, it didn’t. Now here is why I think the ordering was wrong. 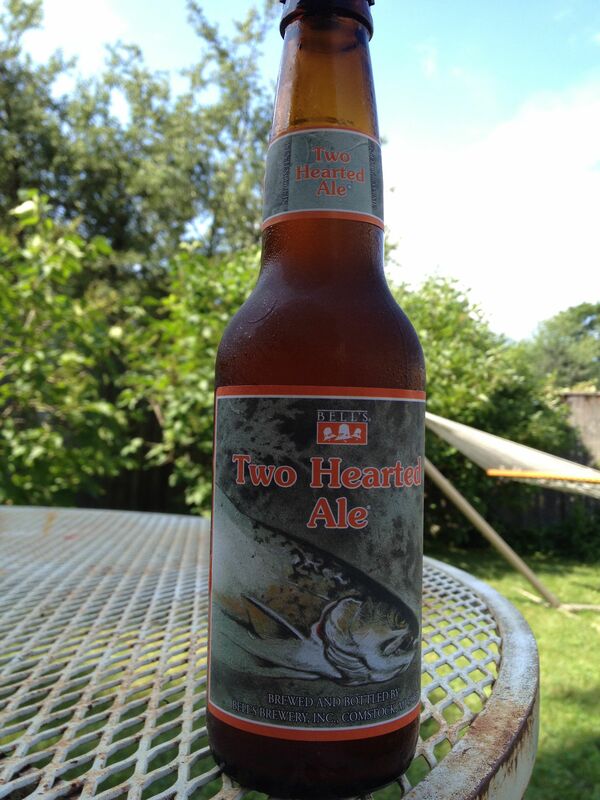 The third beer was Two-Hearted Ale from Bells. The first time I had this beer, I was floored. It was flavorful, and very enjoyable. I wished I had easier access to it, because it was unlike anything I have had before. Now maybe after trying a few different beers on this project I have come to discover more beer like the Two-Hearted ale and it lost some of its magic, but I would like to think it was the ordering of the samples. As I have come to expect from this beer, the aroma was a rich bouquet of various hops. The color, was typical of its style, with a slightly cloudy appearance in the glass. On the tongue, the taste was very mild. This is most likely due to the two previous stouts. In the end, I will always enjoy this beer, and it does hold a special place for anyone that has tried it. Just a mention of Bell’s, and the first response is usually Two-Hearted Ale. 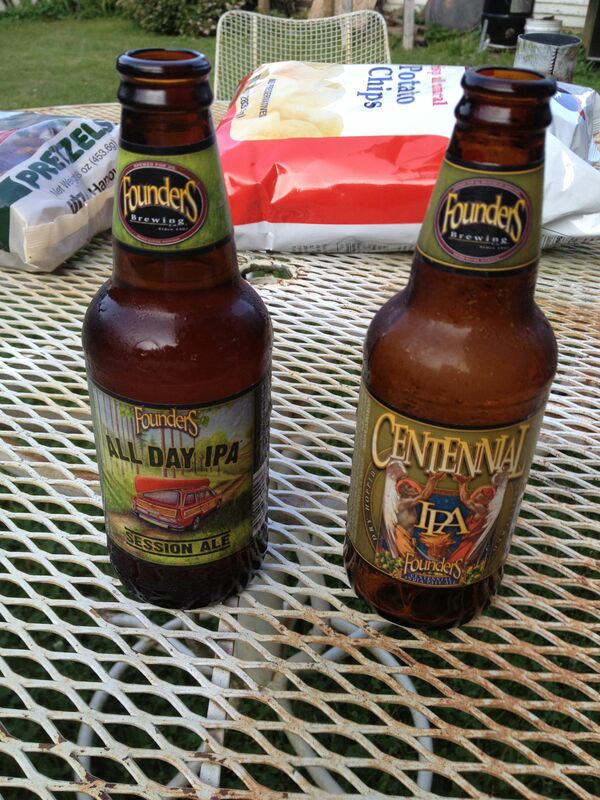 After the Two-Hearted Ale, we had two more selections from Founders, and we started with the All Day IPA. This beer started with “Smells like someone just mowed the lawn” and ended with “All day IPA, I don’t think so.” With its truly distinct aroma, I was expecting to really like this beer, but the finish was off. Very bitter, and not in the good way. Overall, this was not a favorite of the night. We capped the tasting off with a Centennial IPA from Founders. I enjoyed this beer more than the All Day (Disclaimer: That one grew on me too over the evening,) as I enjoy the piney aroma from the Centennial hops. It also had a nicer finish, not as bitter. I think this was my favorite Founders of the evening. At the end of the sampling, everyone went to the cooler to grab a bottle of their favorite of the evening, and we all settled in to enjoy some conversation and a beautiful evening. Thanks for all the participants this week. It was fun.